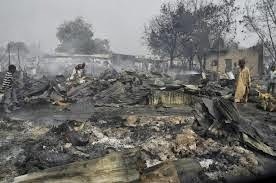 At least 300 people have been killed in a fresh attack in the early hours of Tuesday morning when Boko Haram members stormed Gamborou Ngala town in Borno State, after misleading the security forces deployed to the area to protect the state. The soldiers moved to the Lake Chad axis when they received intelligence report that some gunmen were sighted with abducted school girls moving to the area. The soldiers decided to leave the town for Lake Chad to confront them, but Boko Haram struck just an hour after they left.